Home Lifestyle Dining Out Greg’s Kitchen has moved! Many businesses on Second Road have recently found that redevelopment was happening, with their shops going to be knocked down in the name of progress (or the pursuit of greater profits). Greg’s Kitchen was one of those, and he moved out one month ago. Greg Sulis, the “Greg” of Greg’s Kitchen, is, however, no stranger to moving, having now done it twice in the past couple of decades, so this time he just packed up his pots and pans again and moved further up Second Road, to be in Drinking Street, opposite the well known Tiffany’s Show, an easy landmark to find. Greg’s Kitchen is now also called Greg’s Kitchen, Café, Bar and Grill and is about 50 meters along the Drinking Street soi on the right hand side. You cannot miss it, and as opposed to the previous venue, there is plenty of parking outside on the soi. Another difference is the physical size of the restaurant, now being a single shophouse frontage and encompassing nine tables and a bar along one side. “Much easier to manage and the overheads are less,” said Greg. These lower overheads have actually been passed on to the customers as well, as almost all the items in the menu are now cheaper than before! For example, the imported NZ steaks and lamb chops are only B. 350. The Thai prime minister would be pleased! On the tables are the familiar baskets with vinegar, tomato sauce, mustard, HP sauce and Worcestershire sauce as well as salt and pepper. The tablecloths are bright orange and just make the place brighter and contrast with the green and darker orange walls. After we settled in, we were brought some cold towels, always a very welcome beginning for any meal. Nice touch, Greg. Mains are B. 220-260 and cover fish and chips, roast beef and even half a roasted chicken. If you are just after a snack, these are B. 160 and includes chicken in a basket. Pizza? B. 220, that’s not expensive either. Hanging out for a burger? A 100 percent pure beef burger with thick cheddar cheese and bacon and served with English style chips is B. 195. Of course there are Thai cuisine items, with most around B. 140. 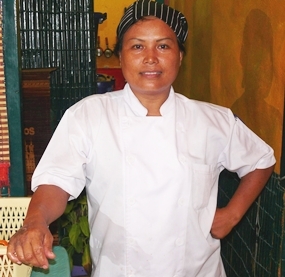 On the wall are some Chef’s Specials such as chicken curry and Indian fried rice (B. 220), and the Sunday Special of roast leg of lamb with roast potatoes, Yorkshire pudding and vegetables at B. 295. House wines are B. 140 a glass or a liter for B. 700 and local beers B. 75 small bottle. With Greg famous for his English food (he’s been in the business for 41 years), I had an English Madame as my companion, who chose the Bangers and Mash (how English can you get) which was very large with two meaty British sausages accompanied by fried onions, mashed potatoes and baked beans. This received an unreserved thumbs up from Madame. I had chosen a beef stew, which came in a very large bowl (Greg built his reputation on not only the food but the size of his portions) and was good to the last drop. Madame ordered a dessert, and for the first time ever, I also lined up for one of Greg’s desserts, a blueberry cheesecake with whipped cream. Really enjoyable, and really too much, but it was fun! 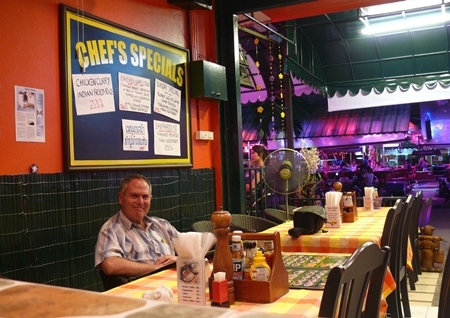 Greg’s Kitchen has been an institution in Pattaya for the past 15 years, and the new venue will become enshrined in the folklore of Pattaya as well. 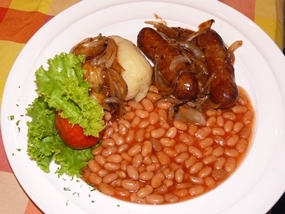 The same great food, the same large portions, the same smiling Greg Sulis welcome. Do go and make the acquaintance again at the new address, or if it will be your first time, make sure you are hungry! You certainly won’t be when you leave. Greg’s Kitchen, Café, Bar and Grill, Drinking Street (Opposite Tiffany’s Show), 98/34 Moo 6, telephone 038 361 227,081 254 3624, www. 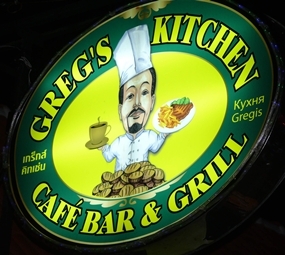 gregskitchennorthpattaya .com, open seven days 11 a.m. until 4 a.m., and yes, they do take-aways as before.